What’s the most important leadership lesson you’ve learned, and how has it proven invaluable? The only thing I have complete control over is myself and my reactions. Instead of being frustrated by exogenous forces or others’ actions, the best thing to do is reconfigure my response and help shape outcomes by graciousness and subtle shifts in my own behavior. I’m certainly far from perfect at it, so I check myself and focus on it each morning and afternoon to recalibrate my expectations and appreciate others’ efforts and my own work with sincerity. What do you aspire to accomplish in your career, and why? I became a zoo veterinarian because I wanted to work in conservation and save species. Through a lot of hard work and a little luck, I landed a job with San Diego Zoo Global, working at the San Diego Zoo Safari Park, where we work to end extinction. Whether it’s serving as veterinary advisor for a local conservation program – like [the one trying to save] the mountain yellow legged frog by breeding the endangered species in captivity to repopulate the wild – or working as part of the team providing veterinary care and insight – like the Northern White Rhino Initiative, which seeks to bring back that species from the brink of extinction – I’m living what I once aspired to do. One of my big objectives right now in my career is to decide what big (and small) goals to set for my future. I contemplate mastering effective medical intervention for bird species, solving complex health issues like copper deficiency and parasite problems in hoofstock, or representing my field on a larger scale in both the zoo and science world. My first introduction to AWIS was through a member on a Johns Hopkins alumni kayak trip in La Jolla, so to start, AWIS and its stellar former president helped me navigate literal tides and currents while providing fun and engaging conversation. To me, that’s what it’s about – mentorship, friendship, and leadership to help us feel confident and give back to the other women in the STEM fields. What do you consider your most important career achievements, milestone or accomplishment, and why? My biggest career accomplishment was in September 2017 when I became board certified by the American College of Zoological Medicine. After my undergrad years, four years of vet school, two internships, and a residency (with a bonus master’s in public health, completed part-time during internship and residency), I achieved a goal I set for myself nearly 15 years before – when I set out on this crazy journey to become a zoo vet. First and foremost, I see myself as a veterinarian. Vets occupy a unique realm in the STEM arena as they use a lot of soft skills, like communication, flexibility, and empathy, to practice their science. Where vets stand out to me, though, is in their training in environmental health, zoonotic diseases, and the intersection of all these things – what’s now dubbed as “one health.” By encouraging STEM professionals to leave their silos and gain perspective and insight from others, we gain a more holistic view and practice of health, human, veterinary, public, and environmental. Describe how an amazing opportunity that has helped advance your STEM career. When I was in middle school I had the opportunity to meet a veterinarian who worked at the Dallas Zoo. I asked her what she had done to become a zoo vet, and through that conversation, a lot of tenacity and the beneficence of that woman, I gained a mentor for life. I was able to work with her on a research project exploring distemper virus in seals, to shadow her as a veterinary student, and to gain her guidance as I applied for residencies and jobs. We have stayed close throughout these many years, and I hope to someday pay forward that generosity to another [woman]. Many of the people I work with in the veterinary field or in biology or animal care are women. Empowered women empower women, and I have sought to practice that [sentiment] as my career has advanced. I train veterinary students at the Safari Park and recently started mentoring students working in master’s programs similar to my own, analyzing clinical data to generate better interventions and animal care. As a strong woman in the workplace, I hope to show male students and colleagues that women are resilient and effective coworkers and leaders. My job is always a puzzle. A wise professor once said that being a veterinarian is a lot about practicing medicine in the absence of certainty. By adding exotic and wild patients to the mix, that uncertainty is multiplied. As a zoo vet, I engineer a lot of complex solutions to simple problems because our patients require me to be creative, innovative and flexible. How much antifungal medication do I give an aardvark? How do I find what’s causing a rhino’s anemia? I piece together knowledge of closely related species and rely on the knowledge gained by colleagues or past cases to develop plans and be humble and observant enough to change course if they don’t work out. Time management is always a challenge. As technology advances, there’s more data to record, more communication layers to answer, and more specialized tools to master. There is a constant struggle to ensure appropriate prioritizing in order to practice the best medicine for the widest array of patients while meeting stakeholders needs’ outside the walls of the hospital. I have sought also a better work-life balance to ensure that when I’m at work, I’m focused on my job. When I’m not at work, I try to rest and rejuvenate to show up re-engaged and ready to work during the week. 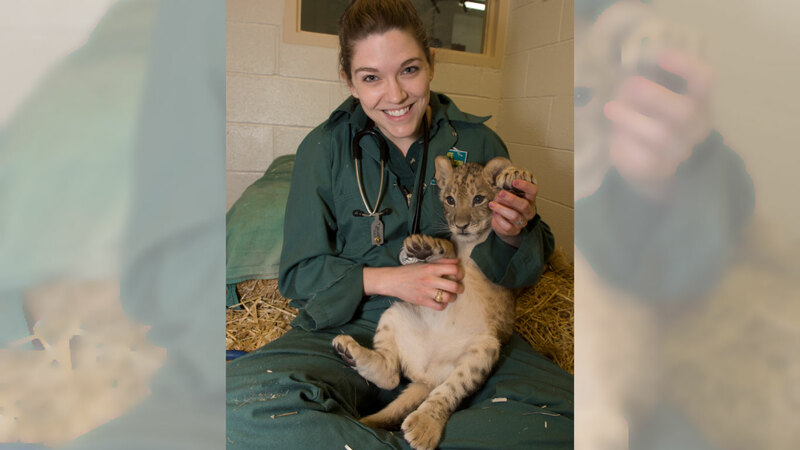 Meredith M. Clancy, a graduate of Texas A&M University, is an associate veterinarian at the San Diego Zoo Safari Park in Escondido, California. She completed a residency in zoo and wildlife medicine with the Wildlife Conservation Society, headquartered at the Bronx Zoo in New York City, New York. Previously, she earned a Master’s in Public Health from the Johns Hopkins University’s Bloomberg School of Public Health in Baltimore, Maryland, while working as veterinary intern at the National Aquarium. She served on the executive board for the American Association of Zoo Veterinarians as the chair of the Infectious Disease and Disaster Preparedness Committee. As part of San Diego Zoo’s global veterinary team, she is advisor for the mountain yellow legged frog and ringtail cat local recovery projects. When she’s not working, she can probably be found running along the beach, at spin class, or enjoying a nice glass of wine.